I took my first watercolor classes with Robert Duffy in Worcester’s “Night Life” in the 70s. After retiring from teaching English at Holy Cross College, I enrolled in Kat O’Connor’s classes at the Worcester Art Museum to work exclusively in watercolors. My subjects are traditional landscape and still life, mostly drawn from New England. Study with Kat O’Connor at Ghost Ranch, NM, challenged with remarkable new shapes and colors. Wherever I travel, I sketch each locale’s distinctive look and color. My work is developed from on-site sketches and photographs, and then completed in studio. I search for the abstract forms in nature, the colors and textures. I do not copy but look for the essentials and create a design that is satisfying for shape, color and atmosphere. Nature always instructs. One observes, then moves to the painting itself where it becomes its own end. 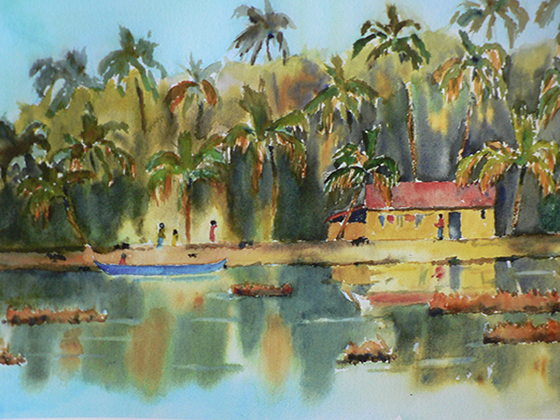 Watercolor has its own mind as the pigment acts with water, at once unpredictable and rewarding.